At the heart of Hello Mornings is one simple habit. 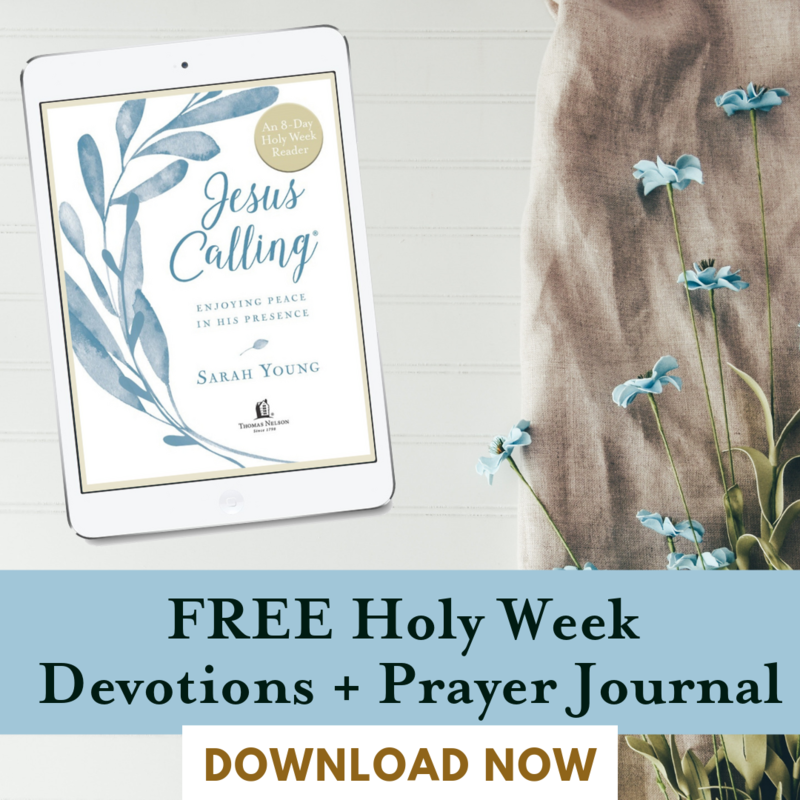 We believe that if we can help you build the habit of meeting with Jesus — trusting that He has a plan for your life and living as though you trust that plan — that habit will grow, as habits always do. We also offer Bible studies, planning and fitness resources, and group challenges designed to help you build on that one foundational habit. 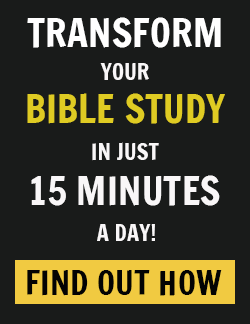 Our focus isn’t necessarily teaching in-depth Bible study methods, perfect planning techniques, or ideal fitness regimens. Yes, we introduce people to all of those, but our core purpose is to help you solidify the habits needed for each. 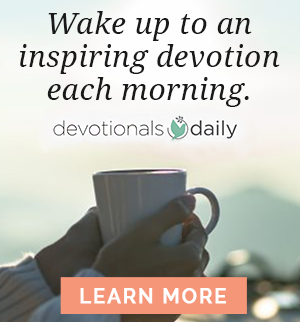 In just a few minutes each morning, anyone can attend to important yet often overlooked aspects of life — a relationship with God, planning the day, and improving health. The goal isn’t overnight transformation but slow and steady progress toward lifelong habits that radically change the direction of our lives and allow us to thrive in whatever role God has given us. We believe there is great power in small deeds done with great faithfulness. From the very first day of school, we learn a little bit of reading, a little bit of writing, and a little bit of arithmetic. We don’t perfect our skills in one area and only then move on to the next. Our teachers don’t lock up the reading books until we’ve learned our arithmetic or our writing. Each skill plays an important role. Simply buying gum at the store requires reading, writing, and arithmetic. From a young age, we need basic ability in multiple areas to get through our day. The same is true in our grown-up daily lives. That’s why in Hello Mornings we tie three essential areas into one habit: God, Plan, Move. Each element is important to a well-lived life. Of course, our time with God is by far the most important, but the ability to plan and manage our energy is also integral to walking out our faith and living life well. 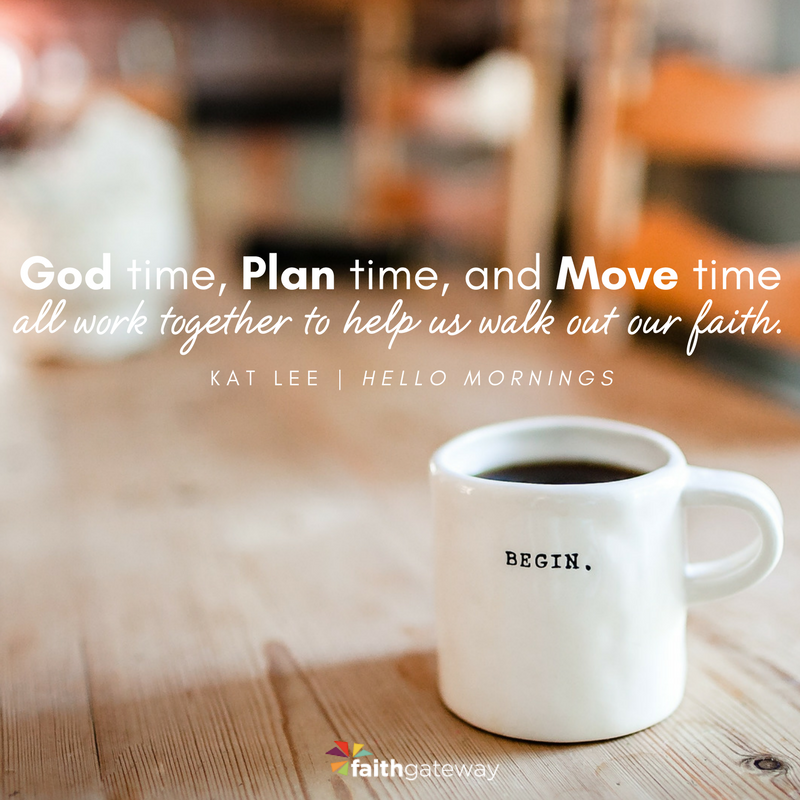 God time, Plan time, and Move time all work together to help us walk out our faith. To develop perfect, in-depth morning routines in all these areas could take a lifetime of work. 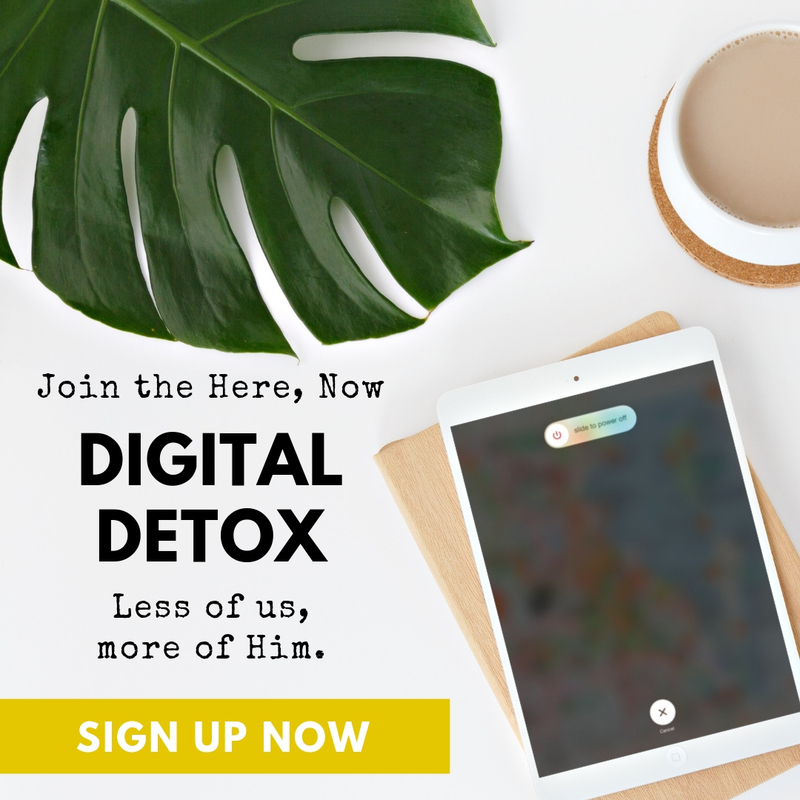 But we can’t wait a lifetime to connect with God, to live purposefully, or to take care of the health God has given us. Just as with reading, writing, and arithmetic, the power is in starting now and starting small. While one minute of prayer, planning, or exercise each day might seem silly, the impact of being a person who “exercises each day” or “plans every day” or “prays every day” cannot be overstated. Even if it is for a tiny amount of time, the more we consistently repeat a routine, the more we identify ourselves as action-oriented people who are constantly growing. Imagine after just one month being able to say, “I started every single day with Jesus for this whole month, and I was purposeful with my time, and I exercised every day. For a whole month.” These may be small habits, but there is power in laying a solid foundation — and in knowing that you can be that person. It will bleed into the rest of your life in unexpected ways. When I first met my husband, Jimmy, in college, it affected how I organized my day. If I knew he was going to be at the library at a certain time, lo and behold, I needed to be at the library at that very same time. Crazy coincidence… I not only changed my daily plans, but I also went to the gym a bit more and had fewer late-night cookie binges. My affection for him wasn’t limited to the time I spent with him; it influenced the rest of my day and my choices as well. We often hear about people making radical transformations in their health after having children. Some quit smoking. Some lose weight and build muscle. Some people change jobs or remove themselves from destructive friendships. When I became a mother, it affected every single area of my life — what I ate, what I read, what I watched on TV, and how I spent my time. Our love for God should have every bit as much of an impact on our day-to-day lives. The heart behind God, Plan, Move is to create an on-ramp for our God time to infiltrate the rest of our day. It starts with time in the Word and prayer, moving into prayerfully planning our day, and then ensuring we have the energy that day for whatever God may ask of us. We ultimately pursue planning and fitness not because we want to be organized and fit. We do it because we want the Spirit of God, the truth of God, and the life of God in the very corners of our lives. To do anything well, we must first know our purpose, then create a plan to carry out that purpose, and finally have the energy to power that purpose. We can see the benefits of having a purpose, planning well, and having the power to follow through in almost every sphere of life. From the athletic arena to construction sites to the boardroom, these three elements are central. A basketball player first meets with the coach, reviews the game plan, and then warms up before setting foot in the game. A musician connects with her band, reviews the set list, and tunes her instrument before stepping on stage. A businesswoman connects with her boss or her team, reviews the plan for the day, and then grabs some coffee before she tackles her to-do list. These three elements of purpose, planning, and power correspond to the three parts of the God, Plan, Move concept. We as believers, as ambassadors of Christ, should enter our days with every bit as much intention as an athlete steps onto the field or an entrepreneur enters a meeting — with faith-filled purpose, a plan, and the power to live it out. While each element is very different, if we choose to tie them together, they can then be far more powerful than they ever were apart. Think of it like a motorcycle. A motorcycle is made up of three primary elements that make it move: the engine, the frame, and the tires. All those components work together to create a final product that is efficient and effective. Separately, they range from less powerful to completely useless. Our God time is like the engine that moves us, our Plan time is like the frame and handlebars that steer us where God leads, and our Move time is like the tires that allow us to progress easily. We don’t want to build an out-of-balance morning — all engine and no tires. We want our morning routine to be well-rounded and effective so that we can make the most of the days God has given to us. Having our God time is essential. It is far and away the most important. But our Plan time and Move time put feet to our faith. The Pharisees and Sadducees were experts on the Law, but they didn’t allow it to influence how they lived. In Matthew 23, Jesus shared example after example of how they essentially missed the forest for the trees. They prided themselves on following the details of the Law but missed the heart of it. They knew it inside and out but failed in the application. James calls us to be not only hearers of the Word but doers as well (James 1:22). If we are spending time with God, laying down our lives at His feet, doesn’t it make sense to then lay our daily plans at His feet? Shouldn’t our faith infiltrate how we live our lives and spend our time? If God has plans for our lives, shouldn’t we make choices that help us have the energy to live out His great purpose for us today? Faith by itself, if it is not accompanied by action, is dead. But someone will say, ‘You have faith; I have deeds.’ Show me your faith without deeds, and I will show you my faith by my deeds. I want to accompany my faith with action. I want to open my Bible with the mind-set that God may ask me to actively respond to what I hear from Him that day. So when I read about loving my neighbor, the rest of my morning routine offers a track to walk that out. I can add “make soup” to my daily plan, and then I can make sure that when I go on my daily walk, I bring the soup to drop by my ill neighbor’s home. We aren’t only building isolated habits in our morning routines; we are also conditioning ourselves to be open and ready to respond to whatever God may lead us to do each day. That’s why I don’t want my lack of energy to cause me to walk right by the woman desperate for eye contact and a hug. I don’t want my lack of planning to create a spiral of hurry and frustration. Instead, I want to have the wisdom, forethought, and energy to make choices that spread hope. Maybe my extra tenderness to my children will give them the security to ask the new child in class to join them for lunch. Maybe that friend connection will comfort that child’s broken heart in the midst of her parents’ divorce. Never underestimate the impact of your life and the effect of living it well. The Enemy wants you to believe you are small and that your life doesn’t matter, when, in fact, God wants to use you to radically influence the world around you. If you’re going to embrace God’s plan, it will take some change — and change requires purpose, planning, and power. Excerpted with permission from Hello Mornings by Kat Lee, copyright Rachel Lee.